Agricultural Chemical Products - Reichman Sales & Service, Inc.
Quadris Top® SB Fungicide Syngenta Crop Protection, Inc.
Quadris® Syngenta Crop Protection, Inc.
Topsin® 4.5FL Fungicide United Phosphorus, Inc.
Quilt Xcel® Syngenta Crop Protection, Inc.
Tebuzol® 3.6F Fungicide United Phosphorus, Inc.
Apron Maxx®RTA® Fungicide Syngenta Crop Protection, Inc.
Aprovia® Top Fungicide Syngenta Crop Protection, Inc.
Bravo Weather Stik® Fungicide Syngenta Crop Protection, Inc.
Cuprofix® Ultra 40 Disperss United Phosphorus, Inc.
Echo® 720 Sipcam Agro USA, Inc.
Echo® 720 Fungicide Sipcam Agro USA, Inc.
Revus Top® Fungicide Syngenta Crop Protection, Inc.
Super Tin® 4L Fungicide United Phosphorus, Inc.
Trivapro™ Fungicide Syngenta Crop Protection, Inc.
Staunch® II Herbicide Tenkoz, Inc.
Ultra Blazer® Herbicide United Phosphorus, Inc.
Broadloom™ Herbicide United Phosphorus, Inc.
Maestro® 2EC Herbicide Nufarm Americas, Inc.
Curio® Herbicide Nufarm Americas, Inc.
Cloak® EX Herbicide Nufarm Americas, Inc.
Report® Extra Herbicide Cheminova, Inc.
Dakota™ Herbicide Rotam North America, Inc.
Diablo® Herbicide Nufarm Americas, Inc.
Topeka™ Herbicide Rotam North America, Inc.
Clash™ Selective Herbicide Nufarm Americas, Inc.
Panther™ Herbicide Nufarm Americas, Inc.
Flexstar® Herbicide Syngenta Crop Protection, Inc.
Reflex® Herbicide Syngenta Crop Protection, Inc.
Flexstar® GT Herbicide Syngenta Crop Protection, Inc.
Cheetah® Herbicide Nufarm Americas, Inc.
Interline® Herbicide United Phosphorus, Inc.
Bellum™ Herbicide Rotam North America, Inc.
Callisto® Herbicide Syngenta Crop Protection, Inc.
Explorer™ Herbicide Syngenta Crop Protection, Inc.
Motif™ Herbicide United Phosphorus, Inc.
Callisto® Xtra Herbicide Syngenta Crop Protection, Inc.
Dual Magnum® Herbicide Syngenta Crop Protection, Inc.
Moccasin™ Herbicide United Phosphorus, Inc.
Moccasin™ II Plus United Phosphorus, Inc.
Stalwart® Herbicide Sipcam Agro USA, Inc.
Bicep II Magnum® Herbicide Syngenta Crop Protection, Inc.
Brawl ll ATZ™ Herbicide Tenkoz, Inc.
Prefix® Herbicide Syngenta Crop Protection, Inc.
Boundary® 6.5 EC Herbicide Syngenta Crop Protection, Inc.
Moccasin MTZ United Phosphorus, Inc.
METRICOR™ DF Herbicide United Phosphorus, Inc.
Tricor® 4F Herbicide United Phosphorus, Inc.
Tricor® DF Herbicide United Phosphorus, Inc.
Cloak® Herbicide Nufarm Americas, Inc.
Patriot Selective Herbicide Nufarm Americas, Inc.
Plotter® Agricultural Herbicide Rotam North America, Inc.
Purestand Herbicide Nufarm Americas, Inc.
Primero® Herbicide Rotam North America, Inc.
Gramoxone Inteon® Herbicide Syngenta Crop Protection, Inc.
Satellite® 3.3 Herbicide United Phosphorus, Inc.
Stealth® Herbicide Loveland Products, Inc.
Trooper® 22K Herbicide Nufarm Americas, Inc.
Trooper® P + D Herbicide Nufarm Americas, Inc.
Princep®Caliber90® Herbicide Syngenta Crop Protection, Inc.
Sim-Trol® 4L Herbicide Sipcam Agro USA, Inc.
Edition® Tank Mix Herbicide Cheminova, Inc.
Treaty® Herbicide Nufarm Americas, Inc.
Edition® Broadspec Herbicide Cheminova, Inc.
Rapport® Broadspec Herbicide NuFarm Americas, Inc.
Treaty® Extra Herbicide Nufarm Americas, Inc.
Victory® Herbicide Nufarm Americas, Inc.
Relegate® Selective Herbicide Nufarm Americas Inc.
Triflurilin HF Herbicide Loveland Products, Inc.
Acuron® Herbicide Syngenta Crop Protection, Inc.
Axial® XL Herbicide Syngenta Crop Protection, Inc.
Candor® Herbicide Nufarm Americas, Inc.
Comet® Herbicide Nufarm Americas, Inc.
Fusilade® DX Herbicide Syngenta Crop Protection, Inc.
Grapple™ Herbicide Nufarm Americas, Inc.
Halex™ GT Herbicide Syngenta Crop Protection, Inc.
Lexar® EZ Herbicide Syngenta Crop Protection, Inc.
Linex® 4L Herbicide Tessenderlo Kerley, Inc.
Lumax® EZ Herbicide Syngenta Crop Protection, Inc.
Rapport® TankMix Herbicide Nufarm Americas, Inc.
Stalwart 3W Herbicide Sipcam Agro USA, Inc.
Triplet® SF Herbicide Nufarm Americas, Inc.
Truslate™ Herbicide Nufarm Americas, Inc.
TruSlate™ Pro Herbicide Nufarm Americas, Inc.
Vilify™ Herbicide Rotam North America, Inc.
Buccaneer Plus Herbicide Tenkoz, Inc.
Buccaneer® 5 Extra Herbicide Tenkoz, Inc.
Credit® X-Treme Herbicide Nufarm Americas Inc.
Zyrate® Insecticide Rotam North America, Inc.
Bifenture EC Insecticide United Phosphorus, Inc.
Bifenture® LFC Insecticide United Phosphorus, Inc.
Tombstone™ Insecticide Loveland Products, Inc.
Karate With Zeon Technology Insecticide Syngenta Crop Protection, Inc.
Warrior II with Zeon Techlology® Syngenta Crop Protection, Inc.
Perm-Up® 3.2 EC Insecticide United Phosphorus, Inc.
PermaStar™ Ag Insecticide LG International (America), Inc.
Acephate 90 WDG Insecticide Tide International, USA, Inc.
Acephate® 97UP Insecticide United Phosphorus, Inc.
Endigo® ZC Insecticide Syngenta Crop Protection, Inc.
Force® 3G Insecticide Syngenta Crop Protection, Inc.
Montana® 2F Insecticide Rotam North America, Inc.
Montana® 4F Insecticide Rotam North America, Inc.
Spirato® IMTM 348FS Nufarm Americas, Inc.
Up-Cyde® Insecticide United Phosphorus, Inc.
90% Non Ionic Surfactant AgXplore International, Inc.
Aqua - AMS Heartland Ag, Inc.
Bio-Forge® Advanced Stoller Enterprises, Inc.
Brandt Manni-Plex™ B Moly Brandt Consolidated, Inc.
Brandt Smart Quatro® Foliar Nutrient Solution Brandt Consolidated, Inc.
Brandt® Mag Nitrate 7-0-0 Brandt Consolidated, Inc.
Brandt® Manni-Plex® For Small Grains 2-0-0 Brandt Consolidated, Inc.
Brandt® Smart B-Mo™ Brandt Consolidated, Inc.
Brandt® Smart B™ Boron Solution Brandt Consolidated, Inc.
Brandt® Smart Trio® 4-0-0 Brandt Consolidated, Inc.
Brandt® Smart ZN 6% Brandt Consolidated, Inc.
Compex® Compatability Agent KALO, Inc.
ContaiN™ NBPT with NZONE Max AgXplore International, Inc.
CruiserMaxx® Vibrance® Cereals Syngenta Crop Protection, Inc.
CruiserMaxx® Vibrance® Insecticide/Fungicide Syngenta Crop Protection, Inc. Double Down® Liquid AMS Convenience With Built in Surfactant United Suppliers, Inc. 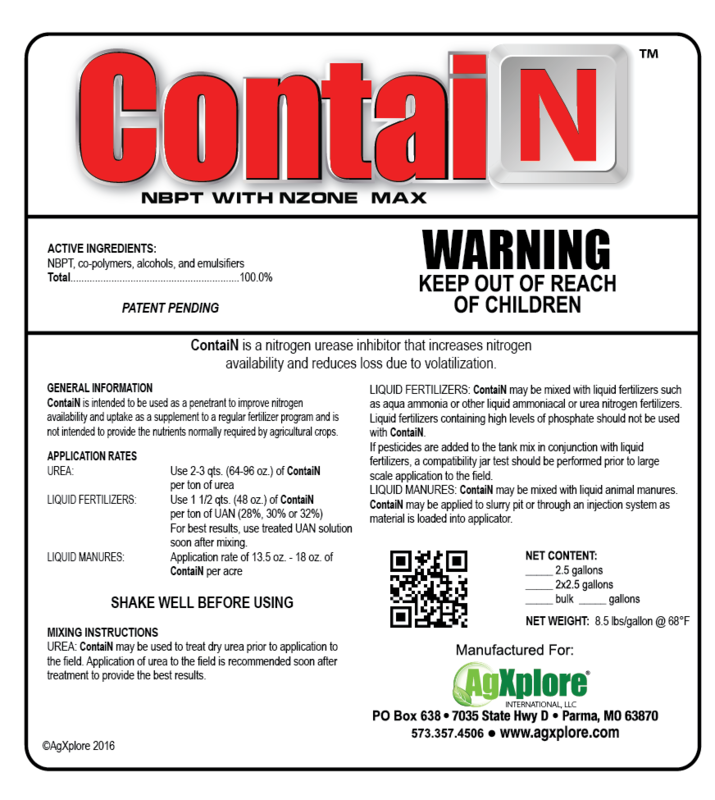 Drift - Check AgXplore International, Inc.
GroPak™ SB AgXplore International, Inc.
HumaPak™ Humic Acid Compound AgXplore International, Inc.
N Pact 26-0-0 Loveland Products, Inc.
NZONE MAX™ Nitrogen Management Aid AgXplore International, Inc.
NZONE™ GL Nitrogen Management Aid AgXplore International, Inc.
Palisade® EC PGR Syngenta Crop Protection, Inc.
pHuse™ Penetrant Acidifier Wetting Agent Spreader AgXplore International, Inc.
Sativa® 309 FS Fungicide Nufarm Americas, Inc.
Sativa® M2F RTU Seed Treatment Nufarm Americas, Inc.
Sativa™ M RTU Seed Treatment Nufarm Americas, Inc.
Sebring™ 318 FS Nufarm Americas, Inc.
Sebring™ 480 FS Nufarm Americas, Inc.
Signet® 480 FS Nufarm Americas, Inc.
Spirato® M 185 FS Nufarm Americas, Inc.
Spirato™ 480 FS Fungicide Nufarm Americas, Inc.
Spray Start™ Water Conditioning Agent Drift Reduction Agent Deposition Aid & Antifoaming Agent KALO, Inc.
ST-Methyl 540 FS Nufarm Americas, Inc. Stimulate Yield Enhancer Stoller Enterprises, Inc.
Sugar Mover™ Stoller Enterprises, Inc.
SulPak™17 8-0-0 with 17% Sulfur AgXplore International, Inc.
Surf 80/20 Non Ionic Surfactant Agxplore International, Inc.
Trinity™ 4-0-0 AgXplore International, Inc.
Tyrant CSOC™ 60-40 Seed Oil Plus AgXplore International, Inc.
Valupak™ 7-12-1 AgXplore International, Inc.
X-CYTE™ Plant Growth Regulator and Yield Stimulant Stoller Enterprises, Inc.
Zinc 9% EDTA Micronutrient AgXplore International, Inc.